Kerala’s capital Thiruvananthapuram is perhaps a shade too placid to be the late O V Vijayan’s Dharamapuri, where his savage, exhilarating satire, Raja of Dharmapuri, is set but it may soon evolve into one. Like any other city, Thiruvanathapuram too worked out a system to collect and dispose of its garbage. But the residents of Vilappilsala, where the factory, as the solid waste management site is referred to, came up, never wanted any of the city waste in their backyards. The factory that the Thiruvananthapuram Municipal Corporation helped set up was to shear the waste of its stench and dirt and convert it into something useful. But the all-pervasive stench, the grey-black ooze and buzzing swarms of mosquitoes show that something went wrong with this conversion. The difference is that a determined Vilappilsala village, about a decade ago, decided not to put up with it. It has done everything it could to stop the garbage from coming in. Children and women have turned themselves into roadblocks to stop the garbage trucks, villagers have formed samitis and gone all the way to the High Court. The waste increased beyond the plant’s capacity, the terms of agreement of the factory management with the civic body, and so forth. Nothing surprising, as this is what happens in most landfills and solid waste management sites in the country. Waste piles up in the capital of God’s Own Country, despite countless meetings and the tenures of two chief ministers from opposite ends of the political spectrum. Governments change, bodies change, but the Vilappilsala panchayat body’s decision remains unchanged. “Politicians come during election time, they say one thing in Vilappilsala and the opposite in Trivandrum city. Political affiliation here is irrelevant, because governments have changed, but the people of that village are consistent, because they continue to suffer,’’ said Shyjan D, an economics lecturer who focused on Vilappilsala in his research paper, “Municipal Solid Waste Management in Cities–Issues of Basic Rights of Surrounding Villages and Alternatives’’. Some city dwellers like Soman Nair hint that a real estate mafia is at work, as protests against dumping city waste have erupted in other towns of Kerala, such as Kannur and Kochi. Some city dwellers, especially those living in apartments, are trying to solve the problem on their own. For instance, those staying in the Kerala State Housing Board complex in Thiruvanathapuram separate their own waste and have taken to pipe composting, aided by government bodies. Those with space, like the Centre for Development Studies, have dug deep pits where they dump waste that does not go in the biogas plant. The admission is reluctant, but it is now finally there. “The urban lifestyle comes with its own problems. How can an apartment dweller compost waste in a garden pit? Also, the use of non-recyclables has gone up, these facts stares us in the face every morning’’ says Radha, a city housewife. As for Vilappilsala, the courts decreed that waste would go to the village but with riders to dispose of garbage properly. The villagers remain unmindful and for the last three months have not allowed the city waste to enter village limits. As a result, Thiruvananthapuram neighbourhoods swell with garbage that seems to have gained a life of its own. It’s deposited every day, from homes, shops, offices, markets, the secretariat, Vidhan Sabha, every place that has a human footprint. Vilappisala is not the lone voice of dissent in Kerala. Outside Thrissur, Kochi, Kannur, Kasaragod, too, villagers are up in arms against the disposal of city waste in landfills and solid waste recycling plants within their jurisdiction. Activists, environmentalists, scientists—all the “-ists” possible—along with the mayor, urban development minister, chief minister, the Congress, the Left, the United Democratic Front, the Left Democratic Front, all possible combines—have meetings every day with the same agenda: Where does the waste go, how does the waste go? It cannot remain in the city, it cannot be in the village, or the sea; it cannot be buried in the forests or allowed to flow into the rivers. The technology to shoot waste out of earth into black holes is yet to be discovered. Nor have our scientists given thought to the possibilities of city waste as defence missiles. So in Kerala’s capital, the breeze from the Arabian Sea not only caries the lush, green scent of summer rain but also the sweet-sour stench of rotting waste from street corners, vacant plots and overflowing bins. It has begun to breed theories as numerous as the viruses, bacteria and mosquitoes in the midden heaps. There’s much talk of theory of waste management, of planned development, of urbanization, of human rights, of rural rights, of consumerism, of capitalistic growth, of environment protection, of recyclable resources, of conspiracy, of political warfare…Take your pick, one is as good as the other. The conspiracy theories are obviously the most exciting and make for good reading. The first reveals that the real hands behind the village protests against the landfill sites belong to the real estate mafia, who bought land cheap and now want the landfill out so that land prices can rise. The second finds shadowy National Democratic Front hands between the UDF state government and LDF municipal corporations. The communist, the capitalist, communalist, the jehadi—everyone has a hand in this kachra business. The fleas and flies multiply, while the chavar talk becomes a full blown maliniyam samskaram (culture of waste) discourse. Welcome to Gujarat, land of a thousand opportunities, where a hard-working state government toils unceasingly to fashion a paradise of plenty. There’s no shortage of waste here, at any rate. Indeed waste, solid or liquid, takes on a life of its own, till something like a Surat plague disturbs the torpor of a sprawling urban chaos. Crows, scavenging birds and child ragpickers at landfills have filled photo frames so often that they’re just a blip on one’s crowded senses now. Except for a small fringe of activists and city planners, families living in them, living by them, evoke little reaction. 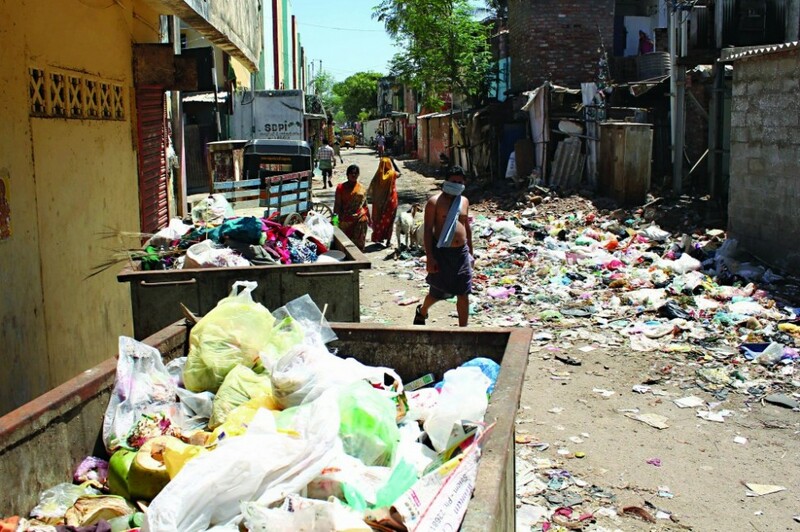 In the city of Vadodara, a branch of Delhi Public School, meant only for the well-heeled, stands barely metres from the city landfill at Vadsar. The children of the city’s rich families go to study in what is believed to be one of its most expensive schools. No one knows how the school came about there, except that the land rates continue to be cheaper. Slowly, flats and shops have come up around the road to the landfill, which used to be deserted not a decade ago. A solid waste treatment plant stands on the way to the landfill site, but to little impact. The landfill continues to choke the Vishwamitri River that once was. 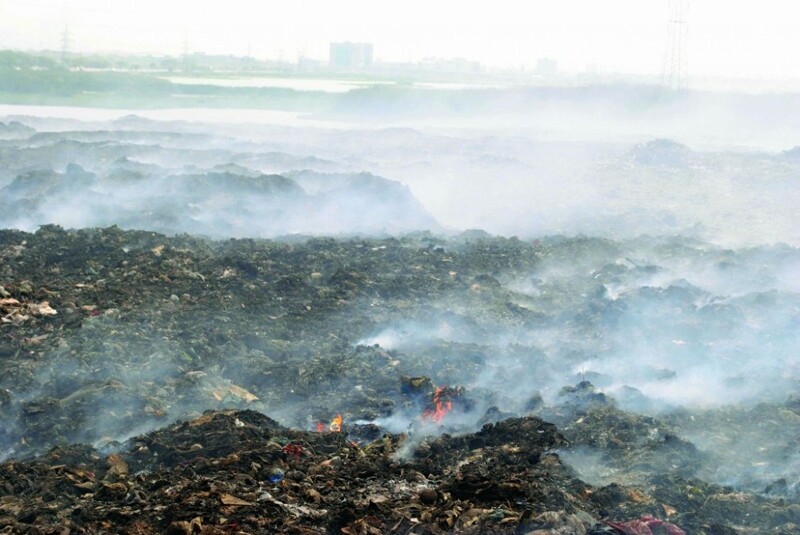 Ahmedabad’s civic managers talk of the Pirana landfill with pride, detailing MoUs for power generation from the methane gas produced naturally from the waste. But the black, foul smelling hillock is now the first story for most of those who cut their teeth as journalists in the city. In the shadow of Pirana stands Citizen Nagar, one of the “must” stops for those on a riot tourist visit to the city. It’s a relief residential colony for the 2002 riot victims. To call it relief, though, is a cruel irony. The ground water is contaminated with refuse and is unusable. For once, the state can’t be blamed for it never did any rehabilitation work for riot victims. The private relief agencies wearily admit that they could not find any other place to shift people from the temporary refugee camps a decade ago. They’ve been on the garbage heap since they lost their homes. It’s not all bleak, black or hopeless. A little known success story of treated sewage waste put to good used comes from Kolkata. The waters hold a Ramsar recognised (The Convention on wetlands of International Importance) site in addition to being hailed as the world’s largest wastewater fed aquaculture system, where commercial fish rearing as well as farming is done. Called the East Kolkata Wetlands bordering the famous Kolkata address of Salt Lake and Rajarhat townships, it has some 250-odd fisheries fed by treated sewage water, agricultural plots and solid waste farms as well. It is a known habitat for waterfowl and large flora and fauna. The wetlands were developed by British officials who figured that Kolkata’s sewage could not be diverted to Hooghly waters in the late nineteenth century. So they diverted it in the opposite direction to the swampy, marshy areas, which began to clean the sewage. Found to have nutrient potential, waters have since been leased out for fishing as well as agricultural use but reports of its contamination by solid waste worry environmentalists. While Delhi, Mumbai and such aspiring metropolises now boast of landfill sites rising in size to rival multistoried buildings, the prize-winning suggestion for the wackiest way of dealing with the problems of a landfill comes from a civic body meeting in Mumbai. A member had suggested spraying the site at Deonar, Mumbai’s oldest landfill, with perfume, so that residents nearby could bear the stink. For the record, it never was taken seriously, perhaps to the regret of the perfumeries. Is there hope? There always is. Here are two small nuggets, one desi, the other videshi. It is perhaps the Indian cultural paradox, or perhaps, mainland India’s. Our notions of cleanliness and waste are entrenched in a caste system, where the cleaners, the garbage remover, historically, belonged to a particular community. 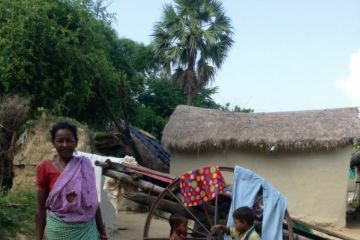 Those who have kept homes and neighbourhoods clean figure at the bottom of the caste hierarchy. Except, perhaps, if you’re a tribal or, as a Mizo colleague insists, a Mizo tribal. They have an egalitarian take on cleaning. The Mizos have a community work tradition called “hnatlang”, which can be called by anyone, but especially by the village councils for various purposes. The youth inform the neighbourhood of the purpose, and volunteer to carry out all the work concerned. So in case of death, everyone is called, the family is assisted in making all arrangements including a grave for the dead. As much a part of Christmas celebrations, “hnatlang” is followed also to clear garbage or when some other civic amenity needs to be improved. Young men and women come with the tools and clean blocked drains, building broken drain walls. Those who refuse to be part of this exercise are socially looked down upon. There was the case of a senior politician in Aizawl who found a stretch of drain blocked during his evening walk and so took a spade and began cleaning it himself. When the neighbours saw it, they too chipped in. After feasts, it is the youngsters who do the clean up work, collect garbage, load it in trucks to dispose of them outside the town/village. The second is a small videshi story . A New York Times report nudges one towards it with a story on an urban landfill site turning into a rowing paradise in New Jersey. It took the civic body some seven years, $100 million and dogged resolution, it reports, for the conversion. “It is out of despair people throw waste anywhere, it is bad especially now for the flat dwellers,’’ says Prabha Chechi (elder sister), as she is called by everyone. Having worked as a cleaning lady at different places, in a private hospital, in homes, her own and others, as well in the country’s premier social science research institute, the Centre for Development Studies, Prabha knows waste close up. 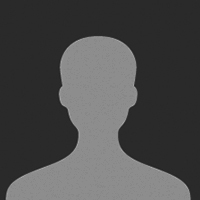 “I worked in a private hospital for six years, but had to leave the job due to health reasons. I got this job with the help of the party. It just takes three hours in the morning, then I work thrice a week in two homes, cleaning, washing and grating coconuts.’’ For most like her, the party in Kerala means the CPI(M). As much as the party, she also owes her present job at CDS to the Vilappilsala waste impasse. Clean, garbage-free Kerala cities were the responsibility of Kudumbashree, the famed Kerala women’s empowerment programme. A smartly uniformed, organised women’s workforce collected segregated waste from households and took them to disposal sites, sometimes to be recycled. In Thiruvananthapuram that was until the villagers in Vilappilsala stopped the garbage trucks coming in. With no place left to dump waste, the collective withdrew from this task, leaving the CDS campus with its hostels, homes and a canteen as much as the rest of the city to stew in its own spewings. Red sindoor, red tilak, neatly oiled hair, gold thali, earrings, a leather strapped watch, blue overcoat, gloves and facemask, make Prabha Chechi the CDS morning feature. “The work is not bad, only when segregating, there can be a problem. People do not like it when I do it in front of homes. I vomited twice when the stink was too bad. I took up the matter with the families and later with the office. In a couple of homes, they told me I should be ready for the stink as I am not here to collect garlands. I know there are no flowers to be collected, but I wanted them to put especially the fish waste in a plastic cover. “Usually there is no problem, people understand, there were just a couple of them who were adamant and refused to segregate. I don’t know who intervened, but somebody did. I retained my job after the complaint and they improved their habits’’. Red and blue-covered plastic buckets labelled bio and non-biodegradable waste make her life easier. Every notice board, be it that of library or the computer centre at CDS instructs all on campus what should be kept separate, the eggshells, onion peel, coconut shells—in short all the biodegradables that cannot go in its biogas plant, which fuels the canteen kitchen. “Few segregate all that should not go to biogas plant. The plastic goes in a pit on the campus. In my home, I don’t throw the waste, I just put it around the trees in my compound. The plastic is less, we burn it. Those who have land, waste is no problem. 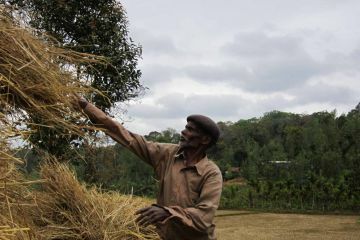 In most villages, like mine, everyone digs a pit around the trees, especially coconut trees, put the kitchen waste, and cover it with mud; it becomes fertilizer for the trees. Urban areas in Asia generate about 760,000 tonnes of municipal solid waste, or approximately 2.7 million cubic metres a day, states a World Bank estimate. In 2025, the increase is estimated at 1.8 million tonnes or 5.2 million cubic metres. According to the report, there is hope in our neighbourhood raddi and kabadiwala. Informal recyclers, as ragpickers and kabadiwalas are termed, handle 27 per cent of the waste generated in Delhi. And if they were to disappear the city would have to pay its contractors to collect an additional 1,800 tonnes of waste every day. Kerala villages are not the only ones to rage at urban waste disposal. In 2008 in Naples, Italy, mountains of solid waste lined the streets for months together as the garbage collectors stopped picking up the waste because all of the region’s landfills were full and residents protested fiercely. The study emphasises that every city or country can have its own method and technologies and methods from one region cannot be fitted into a single mould. For all our civic planners, babus and politicians included, who make a beeline for the Western or developed world technology, it has a warning note—Beware of the magic solution salesman. The report states: The western market for novel waste treatment technologies is proving to be limited. And salesmen, both legitimate and unscrupulous, often target developing and transitional country/cities, desperate to find an easy answer to a difficult problem… A key message of this global report however there is no magic bullet. It cites the instances of Philippines, Indonesia and India to tell how it failed. 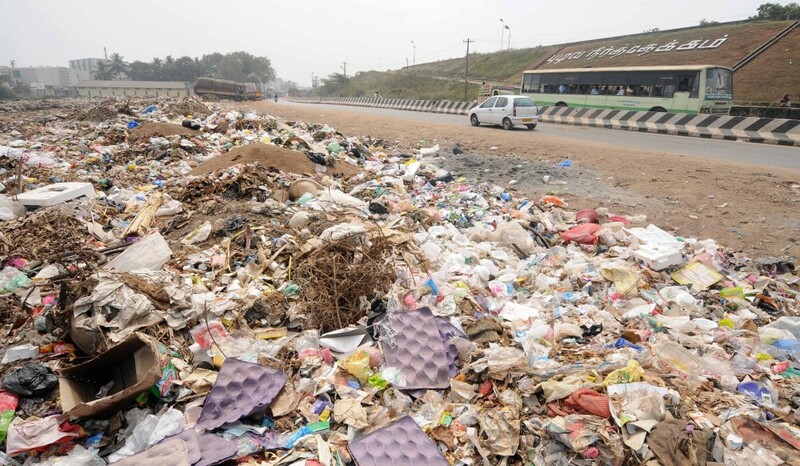 … The World Bank and the Asian Development Bank have emerged as major donors for solid waste management in the region…. Not all has succeeded in the early 1990s for instance incineration plants in cities of Philippines and Indonesia built with assistance from the world bank ended up as white elephants, never to be used due to high organic content, which meant that the waste was not incinerable. In 1984 Delhi municipal corporation built an incinerator to process 300 tonnes per day of solid waste and produce 3 MW of power, with technical assistance from Denmark as a cost of around $43.5 million. The plant closed within a week of opening as no segregation was done. In 2003, an anaerobic digestion plant built in Lucknow with private companies from Austria and Singapore providing technical inputs, could not operate a single day at full capacity due to high level of inert materials in waste. Designed for European waste, they are the landmark failures of imported waste-to-energy technologies in India. • There are 53 cities in India with a million plus population, which together generate 86,000 TPD tonnes per day, or 31.5 million tonnes per year, of municipal solid waste at a per capita generation rate of 500 grams/day. The total MSW generated in urban India is estimated at 68.8 million TPY or 188,500 TPD of MSW. • The composition of urban MSW in India is 51% organics, 17.5% recyclables (paper, plastic, metal, and glass) and 31 % of inerts. • The composition of MSW in the North, East, South and Western regions of the country varied between 50-57% of organics, 16-19% of recyclables, 28-31% of inerts and 45-51% of moisture. Coffee-rich Coorg gets an average of 15 lakh tourists a year, but it’s plagued by a long-term joblessness that is forcing young people to migrate to the cities to repair their fortunes. Thirteen people were sentenced to 20 years for the gangrape of a tribal woman in West Bengal’s Birbhum earlier this year. Many versions of the truth exist.